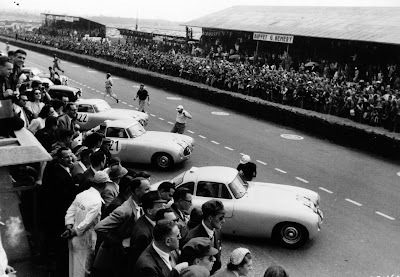 In 1951 the XKI20C came as a surprise to other Le Mans contenders, but in the following year the reputation of Mercedes-Benz and the 3.0 300SL preceded them. The performance of the streamlined coupés in the Mille Miglia suggested that they were superior in maximum speed to the Ferraris and Jaguars and certainly not inferior in road-holding, thus provoking some over-hasty revision in rival equipes' preparations. The Jaguars arrived with new bodies and ran their first high-speed trials during practice. They overheated and were partly and hopefully modified on the spot; many British hopes for victory were consequently centred on the DB3 Aston Martins. Ferrari was represented by an assortment of cars: 4.1, 3.0, 2.7 and 2.6, open and coupé. 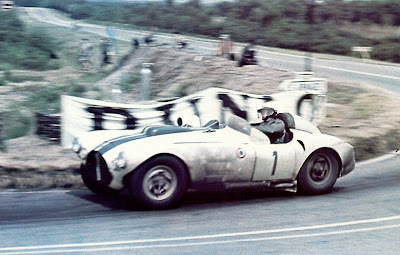 Briggs Cunningham entered two lighter, shorter C4Rs and a C4RK coupe. Of the Talbots Levegh's at last looked like a contemporary sports car, and Gordini entered the dainty 2.3 which had done so well at Monte Carlo and was expected to put up another good performance at Le Mans (if it lasted). Lower in the capacity order came a 2.1 Morgan; two Frazer-Nashes and two Lancias in the 2-litre class; a Gordini, three Jowetts, a Porsche and an Osca in the 1.s-litre class; two IIOO-C.C. Porsches and one IIOO-C.C. Simca, six Renaults, a Panhard and two D.B.s; and, in the 750-c.c. class, three more Panhards. A first-class entry, despite the non-appearance of the expected Alfa Rameo and Pegaso teams, which on paper at any rate, promised a close-fought race. The Cunningham coupe led at the end of the first lap but was soon overwhelmed by the two Ferraris of Ascari and Simon, which were setting a quite unrealistic sprint pace. The Jaguars, and the Mercedes, were quietly holding back at their pre-determined speed. On the sixth lap Ascari stopped with a slipping clutch, and returned to the race apparently intent only on putting the lap record out of reach of his rivals. Moss moved into second place and on the eighth lap Manzon took the Gordini past the two other Jaguars. Within the hour Parnell's DB3 coupe went out with rear-axle trouble and Poore soon followed with the second works Aston. The overheated Jaguars all retired in the second hour, the Mercedes began to move up and, as Simon faltered, Manzon led. He was followed by WaIters' Cunningham and Kling, the latter shortly to be delayed by the defective dynamo which ultimately put him out of the race. At midnight the Gordini led (at 104.4 m.p.h.) by a lap from Levegh (95 laps), Lang and Helfrich (94), Chinetti (Ferrari, 92) and the Macklin Collins Aston Martin (91 laps). Fog in the small hours slowed the race to about 95 m.p.h. and positions remained unchanged until dawn. Then brake failure ended the Gordini's "win or bust" run, whereat Levegh's Talbot led the He1frich Niedermayer 300SL by the healthy margin of four laps and the Hemard-Dussous Panhard took over the lead on Index. Mercedes-Benz seemed content to hold their position on Sunday. The Porsche and Osca entries, still disputing the I.5-litre class, fell out, leaving it to the Becquart-Wilkins Jupiter (in repetition of the 1951 race). Aurelias, eighth and ninth overall at noon, commanded the 2-litres, while Porsche and Panhard led the 1100c.c. and 750c.c. classes respectively. Briggs Cunningham, who drove his own car for 20 out of the 24 hours, pushed on in a passionate effort to succeed. In the early afternoon Lang's Mercedes passed its slowing sister car, a rear-axle failure put the last works Aston Martin out (leaving one privately-entered DB2 to represent the marque) and the Talbot in fifth place crashed. Then, with an hour and a quarter to go, a connecting rod on the leading Talbot snapped, and Levegh, who had consistently refused relief and was bemused with fatigue, was out of the race. The two Mercedes automatically won, deservedly in view of their superb preparation and control, but not perhaps without an element of luck. 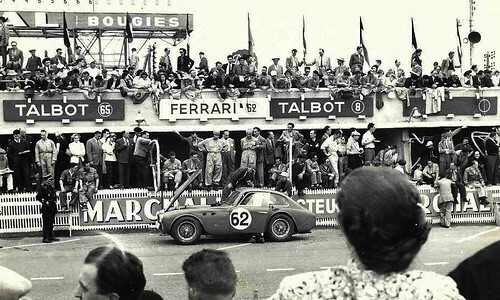 The Nash Healey was third, followed by the Cunningham, the Simca-Vincent Ferrari and the first of the Lancias. Altogether 17 oddly assorted cars of the brilliant field of 57 which started 24 hours earlier survived this most eventful race.